We step off the plane in Tokyo, and we discover something extraordinary: we have x-ray vision! At least, that’s what it felt like, seeing the world without smog. It was like someone flipped the switch on our retinas from regular broadcast to HDTV. As we get closer to the city, we discover another super sense: our hearing has turned supersonic! 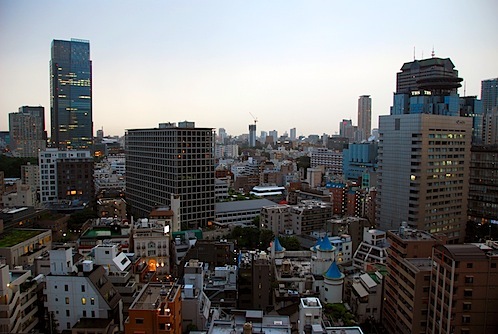 Tokyo is a huge, sprawling metropolis, but somehow, the city is dead quiet. Where is the constant honking? The people yelling at each other on the streets? The tour groups following a megaphone-wielding tour guide? Even at the airport, Jeremy and I couldn’t stop talking about how different Japan is from China. There were two ladies whose only discernible job was to bow at you as you got on the escalator and say “Irashaimase!” (”Welcome!”). The ticket-taker bowed at our bus as it left the curbside. And the smokers! They had to walk outside and go into what can only be described as a Smoking Box (it was like observing animals at the zoo…Oooh! Look! It’s the Commonicus Smokeritus! ), so that their exhalations wouldn’t bother us non-smokers out on the sidewalk. How is it that Japan and China are even on the same planet, much less the same continent?!? The Smoking Box at the airport. Smokers have to leave the terminal and enter this box in order to light up, so that their exhalations don’t bother other people out on the sidewalk. Japan can strike fear into the heart of any budget traveler, but as soon as we land, we can see that we’re going to want to extend our stay, even without any solid plans for our trip here. It is just so freakin’ peaceful in this country (even in the big city), and after a month of Chinese chaos, we’re ready to decompress, watch the world through HD, and listen to the glorious sound of (relative) silence. But, good lord is it expensive! Luckily, we’ve hooked up with an old college friend of Jeremy’s named Joy, who is a Japanese-American expat working in Tokyo, and she’s offered to help us plan our itinerary while putting us up in the huge, gorgeous apartment she shares with her Aussie boyfriend Alex in the Akasaka district of Tokyo. This is a real treat—I was sure that, given our budget, we were going to have to rent out a spot in Kramer’s chest of drawers. The view from Joy and Alex’s apartment. The last time Jeremy bumped into Joy was in SF, and the occasion was actually on our first date—over 6 years ago! Through a crazy Flickr coincidence involving my wedding dress and Joy’s friend Jean, we’ve gotten back in touch with her. Joy is an AMAZING hostess…not only does she love food like we do, but she was mindful of our budget, and she swiftly went to work taking us to all these incredible midrange restaurants around Tokyo. Even better, because we’re saving so much on hotels by staying with Joy and Alex, we actually have some leeway in our budget to sample some of this famously delicious Japanese cuisine. Out with Joy and Alex at our first Japanese ramen experience. You purchase tickets for your ramen via a vending machine, and you personalize your bowl of noodles by filling out a questionnaire, indicating how fatty you like your broth to be, how many green onions you want, if you want pepper flakes, etc. I felt like we were taking a ramen test! 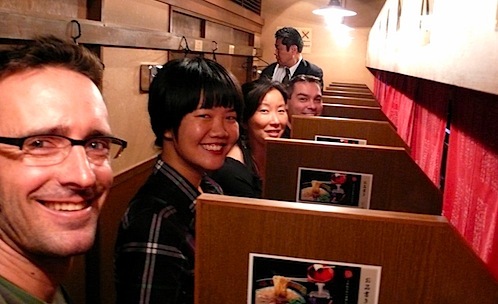 A server lifts up the red curtain in your stall, slides your ramen towards you, and you chow down in your own personal noodle-wrestling booth. No cheating allowed! 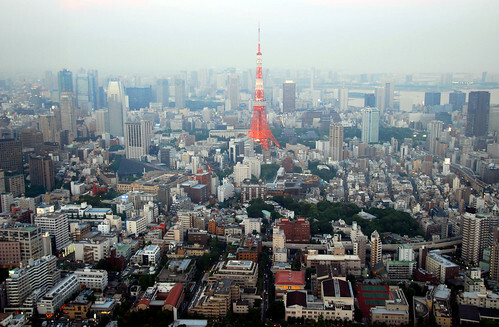 View of Tokyo Tower from the Mori Building. At least that’s easy to find—just look for the big red pointy thing. Further, buildings are numbered in a totally random fashion—by the date they were built. So finding a restaurant or bar is usually a bit of an adventure—typically, you just get to the general area, and then you have to ask around to see if anyone can point you to your final destination. Then once you finally find your destination, the first thing you do is a grab a card (in case you ever want to come back—all business cards in Tokyo are printed with a map describing the establishment’s location), and look around you, trying to sear the surroundings into your brain so you have some way of finding the place again (Is it next to a strange looking sign or statue? Is there a unique building across the street?). Jeremy and I found this process totally fascinating…I mean, what does it say about a culture when everything—including the location of your apartment—relies on context? Making things even more difficult is the fact that very few people speak English here. Luckily, we are usually out with Joy (who speaks Japanese)…and when we’re not out with Joy, we are out with Joy’s instructions, which explain very clearly how to get from point A to point B. This makes the experience on finding stuff in Tokyo a lot less stressful than it could be. I have to admit, I don’t miss being the only one able to speak the local language. Despite the difficulties (which actually just make things more endearing), Jeremy and I quickly become enamored with this beautiful culture. In fact, we see a lot of similarities between Japan and Taiwan (which also hold a special place in our hearts)—particularly the fact that everyone is exceedingly polite and just plain helpful. In some ways (this is going to make my Dad have a heart attack), it almost seems like Taiwan would have an easier time (culturally, anyway) merging with Japan than it would with China. But it’s the little things that make us really fall hard for this country: the fact that most of the ice cubes in Tokyo are hand-chiseled (really, they’re gorgeous). The elaborate toilets. The beautiful manhole covers. The amazingly fashionable people (women in Tokyo can give you a serious ugly duckling complex, especially when you’re wearing Keens). And yes, the sweet, sweet silence. Of course, it doesn’t hurt that the food is incredible. Yes, I think we’re going to like it here. I loved that episode of Kramer’s chest of drawers. So funny of you to mention it. Made me smile all over again. Even though Ketchum has street names, no one knows them (except Main St. and Sun Valley Road). Everything else is “go to the post office, turn rt, go 2 bl, and it’s on the left side of the street.” Or, something like that. Works in a small town.